I start riding at the age of 8 with pony lessons. At the age of 15, I return to learning lad-jockey and my professional jockey career starts. On September 1st, 1994, I had a car accident the day after a victory of a big horse race in Belgium. The diagnosis is irrevocable: I must be amputated from my right leg. After months of rehabilitation, I have to relearn how to walk, to adapt to my prosthesis. But the urge to go back on horse is still very present. I overcome my handicap and thanks to my practice, i acquire the strength to fight and make my life memorable and unforgettable. November 2017 : Champion of FRANCE at ST LÔ with Tarantino Fleuri. November 2016 : Champion of FRANCE at ST LÔ with Voltaire de Bruyères. 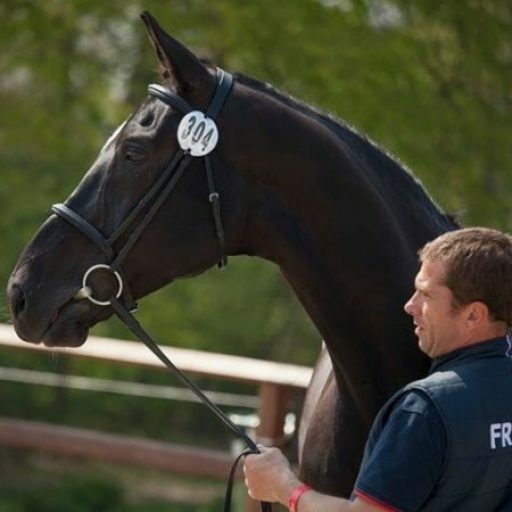 June 2015 : Champion of FRANCE at ST LÔ with Tarentino Fleuri.